Stanhope Forbes was born in Dublin, Ireland in 1857. When he was eleven, Forbes began drawing at the encouragement of family friends who took him on sketching trips. In college, Forbes began studying under John Sparkes. Sparkes emphasized drawing from casts and models, as opposed to copying drawings by the masters. Forbes enrolled in the Royal Academy School and briefly studied under Millias, Leghton and Alma Tadema. In 1880, Forbes traveled to France, enrolling in the studio of Leon Bonnat near Montmartre. In Bonnat’s classes, Forbes was trained to paint from life. However, Bonnat did not sympathize with outdoor painting that was becoming popular with the students at the time. By 1881, Forbes was working in Cancale with other students who revered painting outdoors. The sale of a figure painting to the Walker Art Gallery so inspired Forbes that he dedicated his career to outdoor figure work. Forbes finished his two years of study in France and returned home to England where he was anxious to establish himself as an artist. He began searching for a picturesque village to paint. He settled on Newlyn in Cornwall. Artists had been visiting the coast of Cornwall for years. A recently built rail stop to Penzance, only a few miles from Newlyn, allowed artists to live in the area and still have easy access to London and their galleries. Because of Forbes’ financial and critical success, he was considered the leader of the Newlyn Colony. In 1886, he became engaged to Elizabeth Armstrong—an artist who had come to Newlyn to paint the year before. They married in 1889. Forbes fidelity to outdoor figure work required a Herculean effort. He did not believe in painting nature as is compositionally and so each painting required much planning. 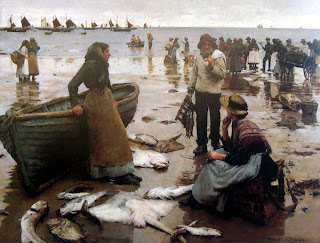 One of his most successful works, “A Fish Sale on a Cornish Beach” is 4 feet by 5 feet, with more than 26 figures. For this painting, Forbes had to contend with the challenges of weather and changing effects of light. To complicate matters, models were often unreliable. Many of Forbes paintings were finished over months, not days, requiring the complexity equal to a movie set. 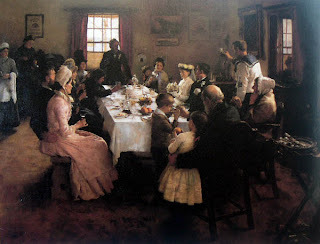 To avoid losing precious time when the weather was inclement, Forbes painted interior scenes. Usually he was working on at least two paintings at the same time—one outdoor and one interior. His greatest successes came during the 1880’s and 1890’s. Forbes continued to paint Newlyn and its citizens for the rest of his life. He died in 1947 at the age of 90. QuoteTo plant one’s easel down in the full view of all and work away in the midst of a large congregation needs a good deal of courage: but it takes even more to boldly ask some perfect stranger to pose for one under such trying conditions. But our principles demanded it and convinced of their virtue, I always strove to be consistent to them.